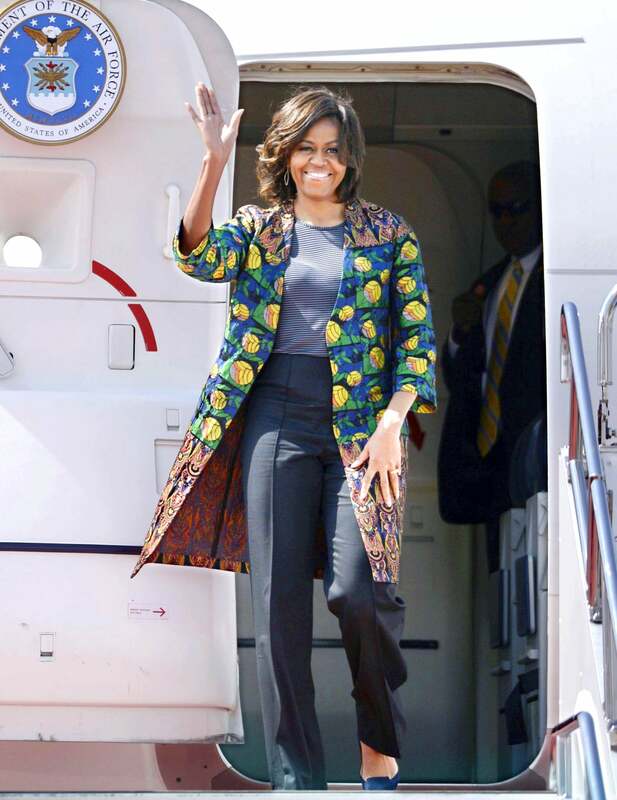 Michelle Obama's lovely feminine looks from her recent Asian tour to support the "Let Girls Learn" campaign had us searching through our closet for some serious prints. 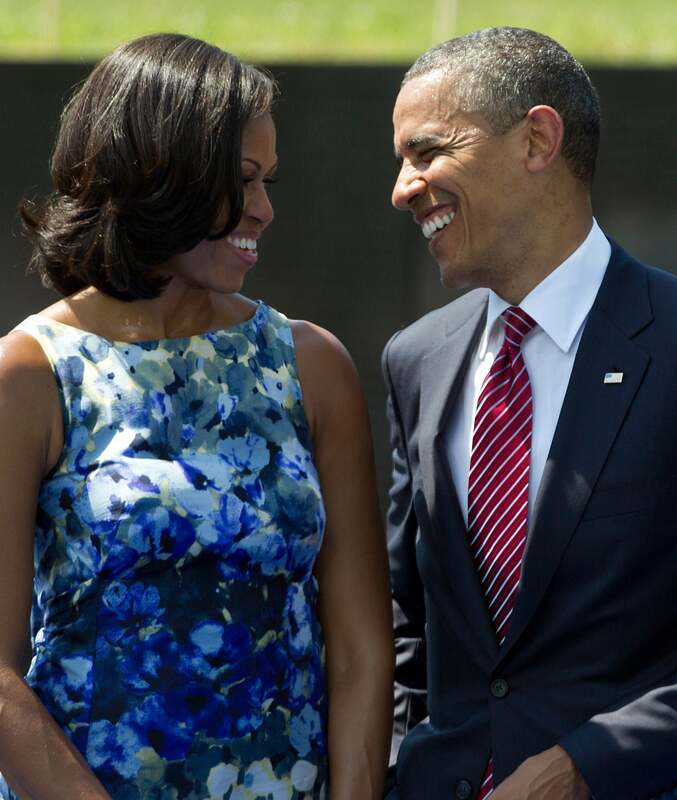 Take notes from the First Lady on how to spruce up your wardrobe this season. 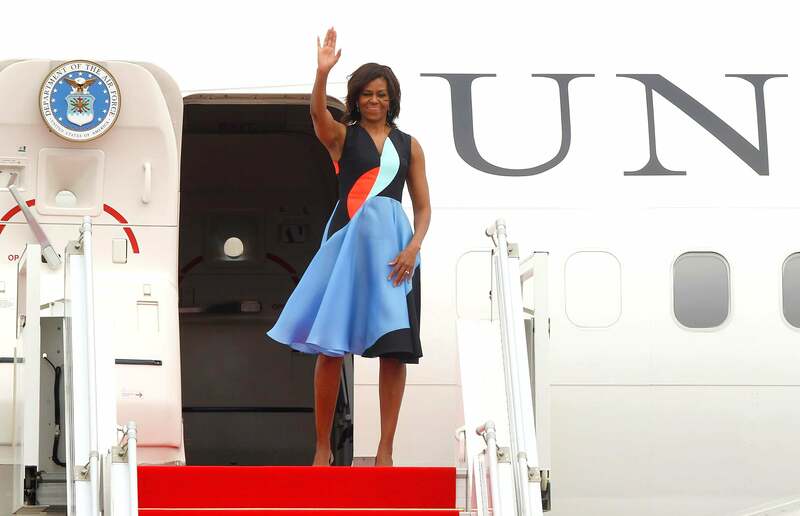 U.S. First Lady Michelle Obama waves as she leaves Siem Reap International Airport in Siem Reap, Cambodia wearing a color block Roksanda Ilincic dress. 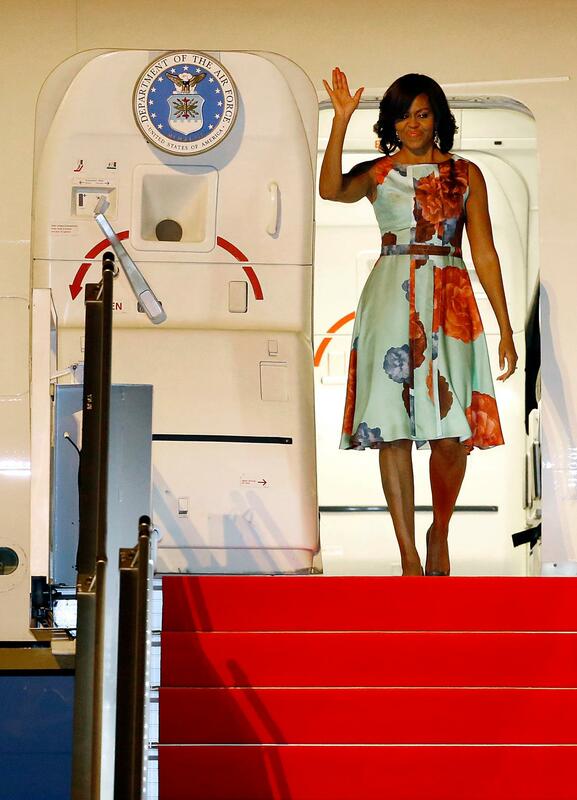 The First Lady arrives in Tokyo rocking a citrine Kenzo dress. Isn't she lovely? 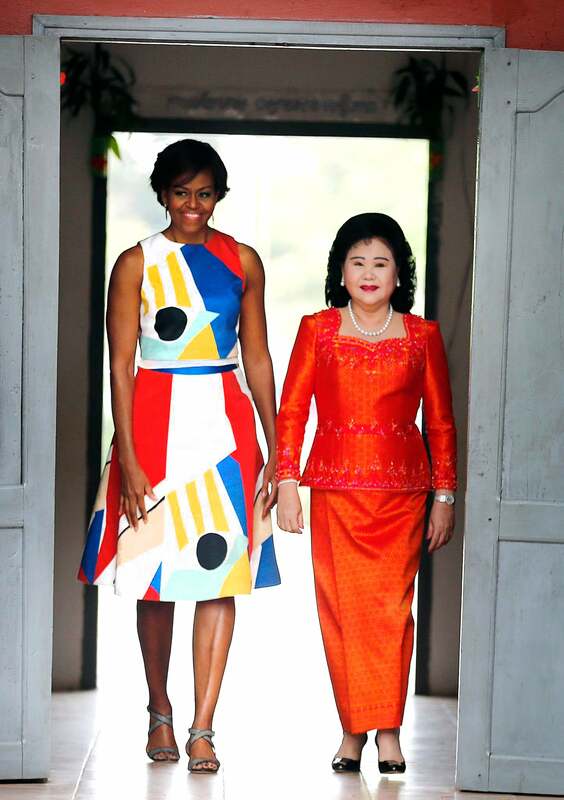 Michelle O rocks a colorful Alice & Olivia dress for her meeting with Bun Rany, the first lady of Cambodia. 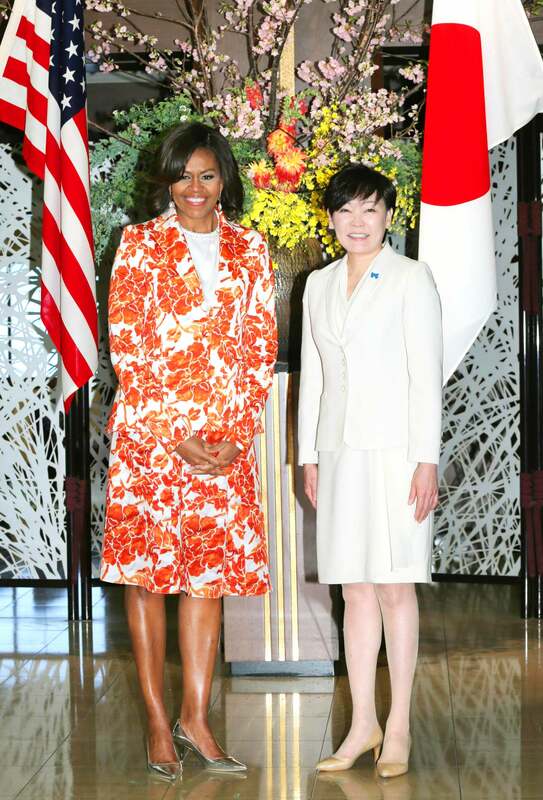 First Lady Michelle Obama looks amazing in a Roksanda Ilincic dress while meeting Akie Abe, the wife of Japanese Prime Minister. Michelle O works prints like none other. Here she wears Dries Van Noten coat. FLOTUS waves upon arriving in Cambodia sporting a Carolina Herrera frock. Play up your patterns with accessories to complement the look like Mrs. O. 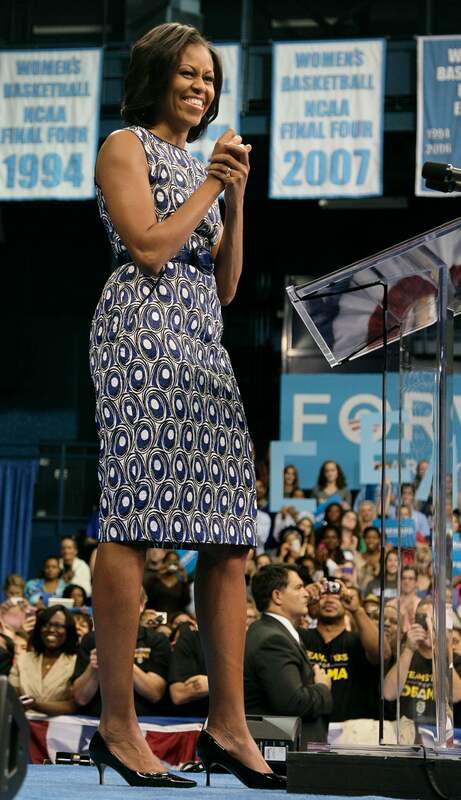 Again, the First Lady is keeping up with the Joneses in this brilliant blue dress at Broward College in Florida. One major plus: the style she's sporting is an affordable Jones of New York dress from Macy's, which means even a diva on a dime can get the look! This leaf-printed Duro Olowu dress, paired with marigold pumps, brightened up the room during a campaign event in Fredericksburg, Virginia. We're definitely not feeling blue about spring, but this color is hot right now—Mrs. O even got the memo. This high-low combo: a Zero + Maria Cornejo geo print dress and Zara suede kitten heels was a killer combo at the awards ceremony for the President's Committee on the Arts and the Humanities in Washington. If wearing in-your-face prints isn't your thing, this subdued style is perfect for you. Mrs. O dazzled us in 2012 with this Tracy Reese stunner, one of the many fab frocks she rocked during the Democratic National Convention. We loved that the soft patterns neutralized the bold color in this dress she wore in Miami. Remember, balance is key when it comes wearing prints. 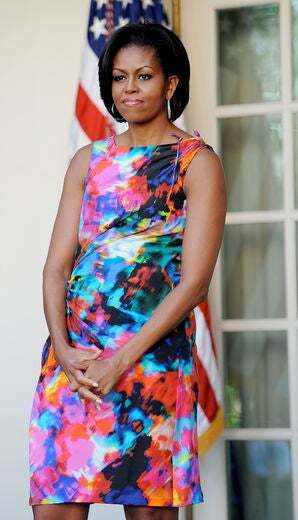 Michelle Obama shows both a demure and daring side in this all-over printed Barbara Tfank style while hosting kids at the White House. Good choice! 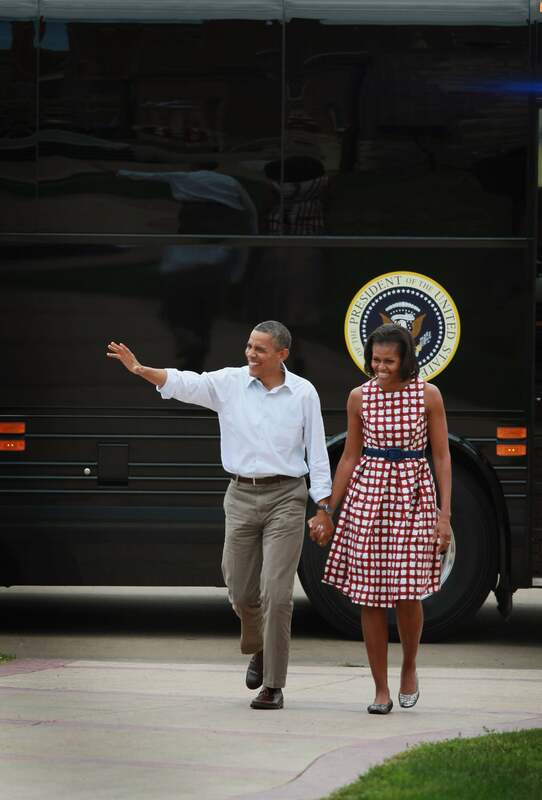 The Obama's may have been campaigning through Iowa, but we saw the First Lady's gingham style dress as the perfect picnic piece! 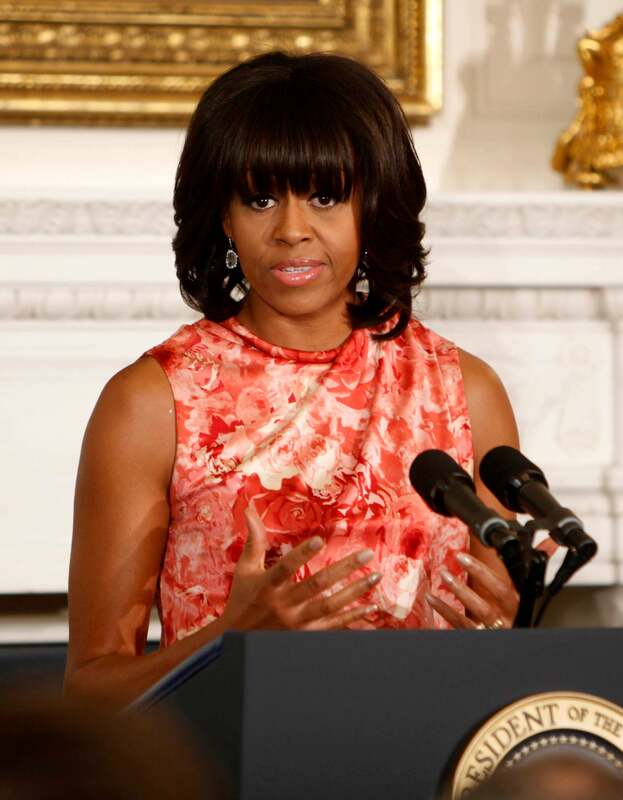 Be bold and step out in a lively look like the First Lady's eye-catching Preen dress. Mrs. O shows how to transition daytime prints into evening wear with this Naeem Khan dress. The key is selecting formal fabrics like the silk style she wore to the Correspondent’s Dinner. Isn't she lovely? Easter isn't the only excuse we have to wear a fab floral print. 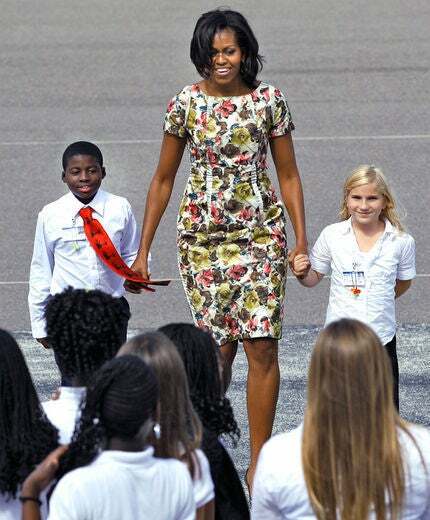 For the First Lady it's another fashionable day on the campaign trail in Florida. 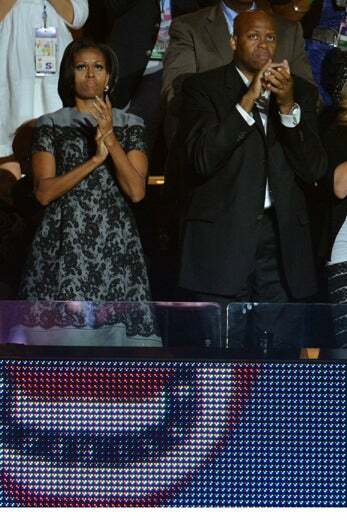 Our First Lady brought fashion to the DNC in a major way! This oxblood damask print dress by Laura Smalls is just another way to pull off prints—tonal and toned down. This tea style dress stole our hearts, and the hearts of campaign supporters in North Carolina. 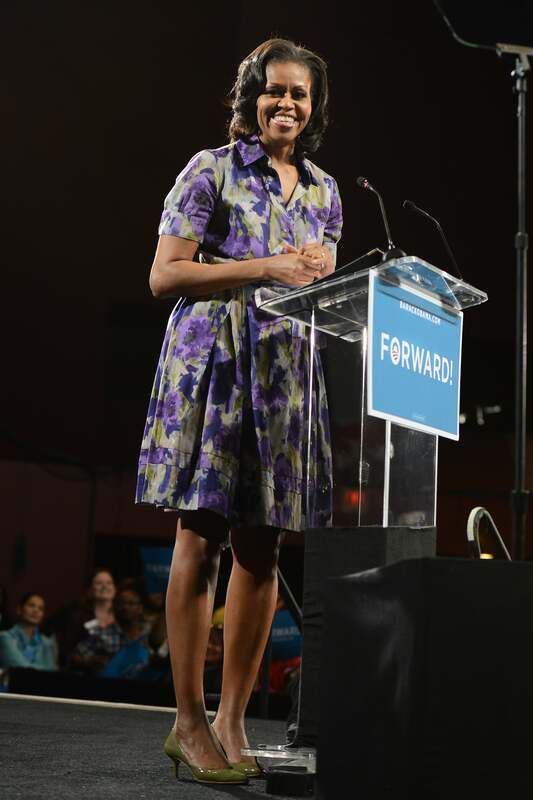 At the War Memorial Auditorium in Florida, Mrs. O springs onto the stage in a pastel mixed print dress. Lace may appear to be an unlikely pattern choice, but it's one of the sweetest selections you can wear this spring. Michelle Obama donned a Thom Browne style that transforms this classic fabric into a modern, sophisticated style when laid over cement grey at the DNC in North Carolina. Go wild with a classic style at work. This traditional shift dress comes to life with a cool pattern, yet still conservative shade. 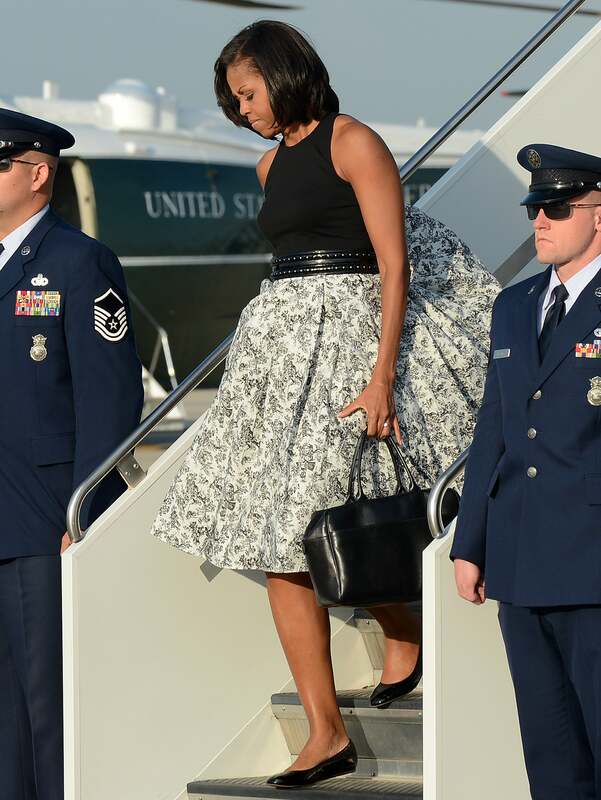 Mrs. O is clearly "gone with the wind" fabulous in this black and white pleated skirt paired with chic black accents as she disembarks from Air Force One in Chicago. Wanna add umph to a basic bottom? Top it off with romantic florals. 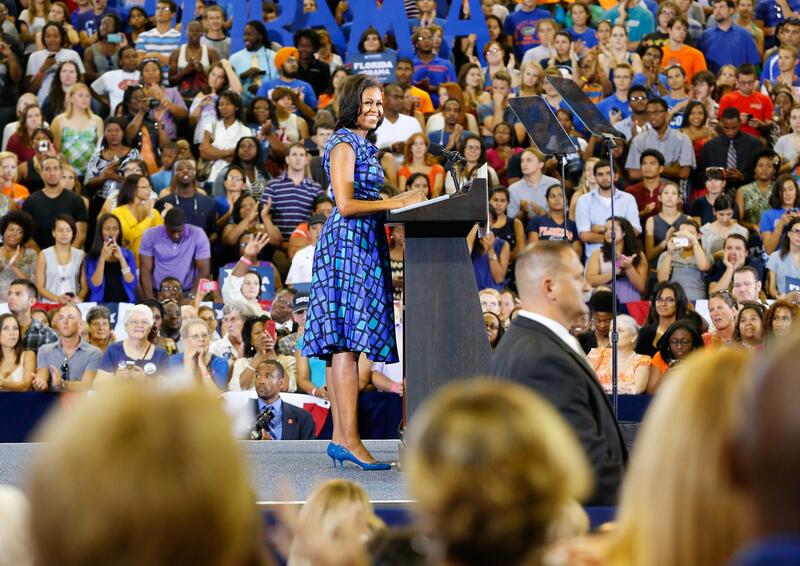 At the University of Florida the First Lady shows how to liven things up with color. Her printed Barbara Tfank dress and matching blue heels was a lovely look for the stage. On a softer note, the First Lady made a lovely appearance on LIVE with Kelly and Michael in a watercolor painted Prabal Garung dress. 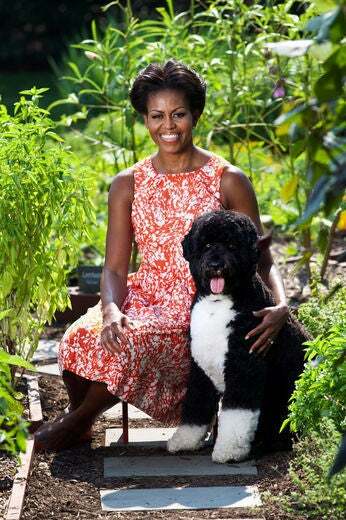 For a portrait with Bo, the First Lady selected an all-American, lovely printed Talbots dress. Don't be afraid to experiment with color. 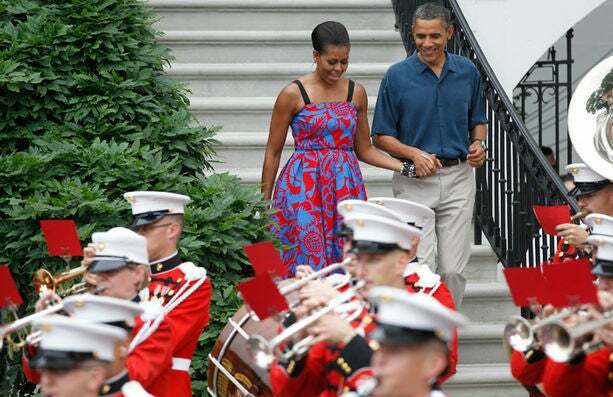 The First Lady does it well in this painterly floral shift dress at the White House. 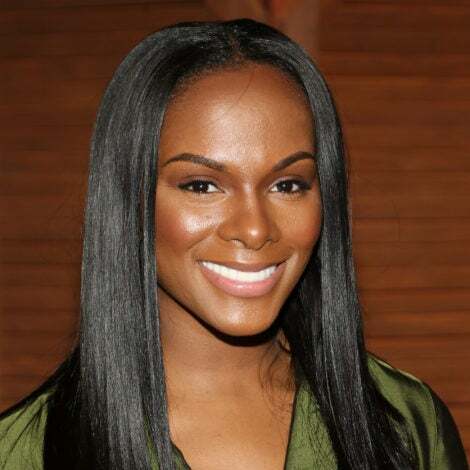 Follow her lead and find a mix of colors that complement your skin tone. 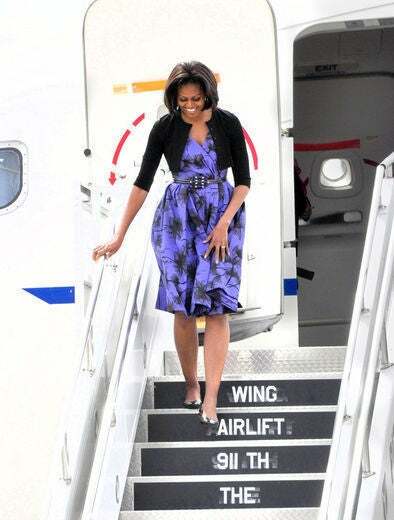 The First Lady recently landed in Pittsburgh wearing a lively lavender frock with a cropped cardigan. Covering up sleeveless summer style dresses and tops is a great way to transition outdoor casual styles into the office. Our favorite floral moment was Mrs. O’s beautiful bronze skin glowing against this tropical dress at the APEC Summit in Hawaii. The First Lady steps off the aircraft and into Mexico City wearing a blend of beautiful blue florals by Tracy Reese. 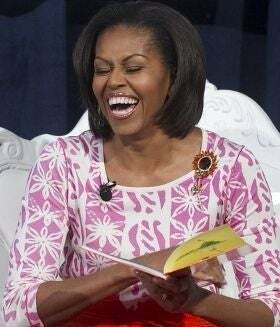 Michelle Obama shares a laugh while wearing a pink and white graphic print top. Now that is something to smile about! Mixing large and small prints is such a fashion-forward move. 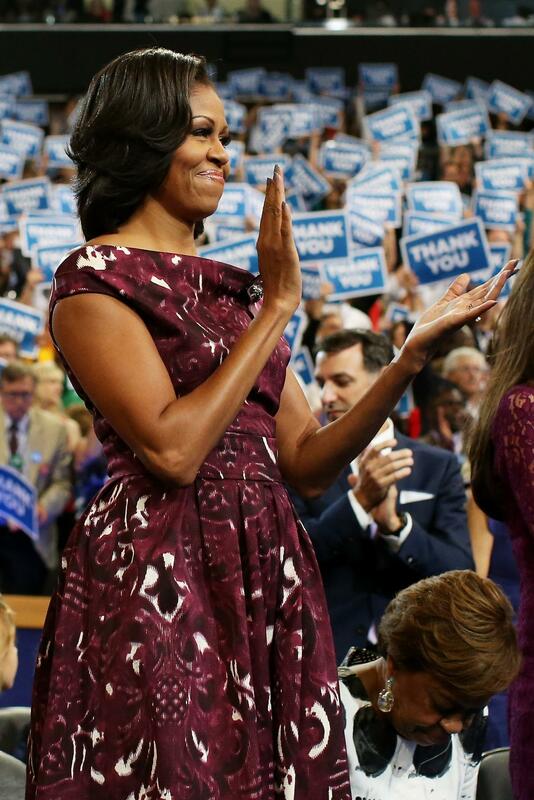 The First Lady nails it in this Peter Som dress. 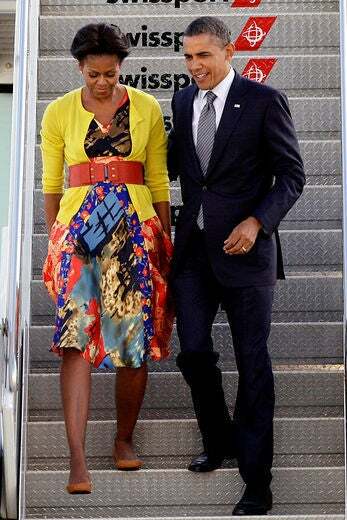 At the Minnesota Air National Guard base, Mrs. O sported a floral print sheath dress by Marc Jacobs with a cheerfully bright yellow cardigan. 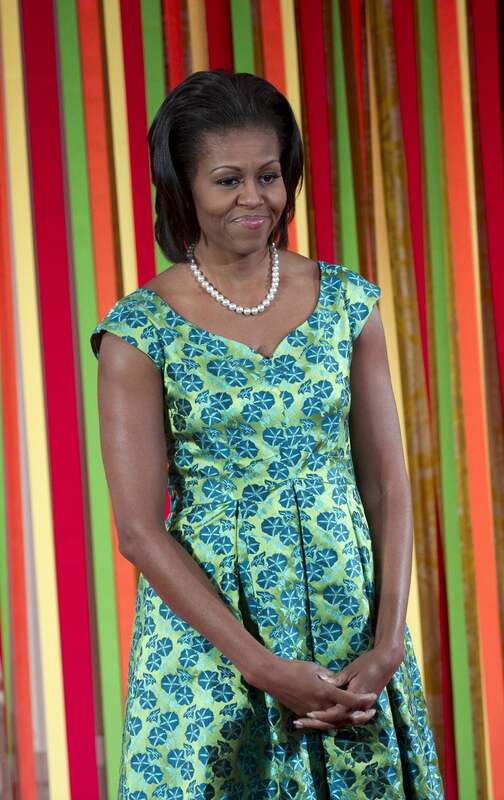 The First Lady perfects a mix of bold bright colors and prints effortlessly. To get this look, accessorize with solid colors that pop out most in the pattern. For a timeless silhouette like this one, add excitement to the mix by choosing a gorgeous floral pattern versus a traditional solid. 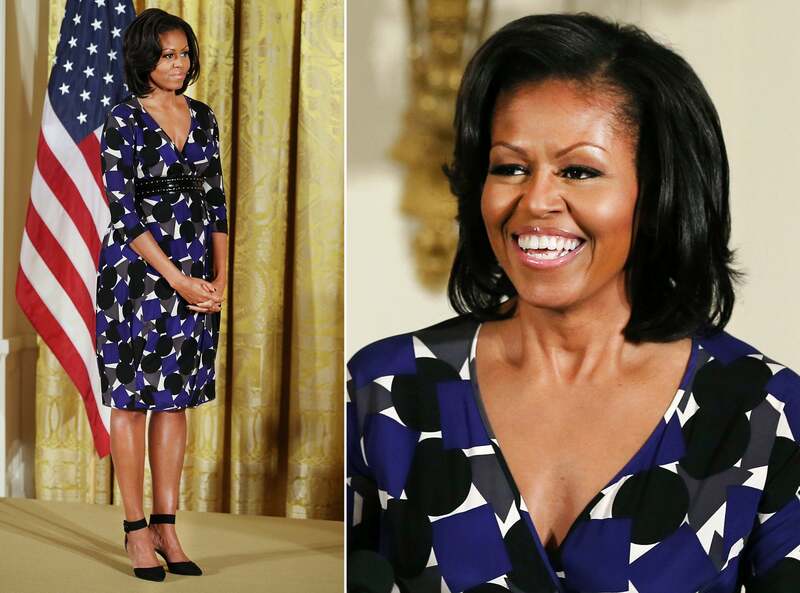 Michelle Obama looks darling in DVF. 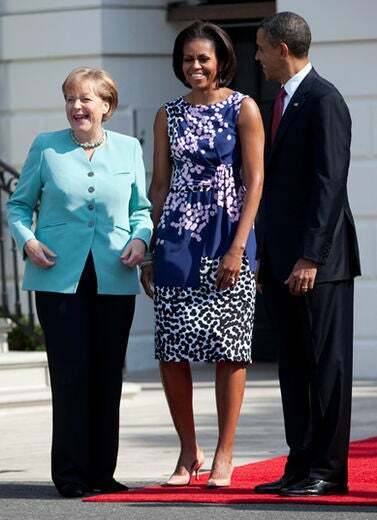 The scattered contrast colored spots stand out alongside the German Chancellor Angela Merkel and the President. 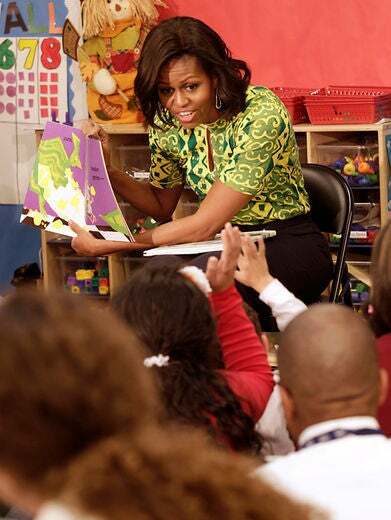 The First Lady wears a refreshing printed Duro Olowu top with her black pencil skirt while visiting an elementary school. Take on the print and colorblocking trend like Michelle Obama, who paired a Diane von Furstenberg graphic number with a pair of colorblocked cap-toe pumps while prepping for the DNC last year. 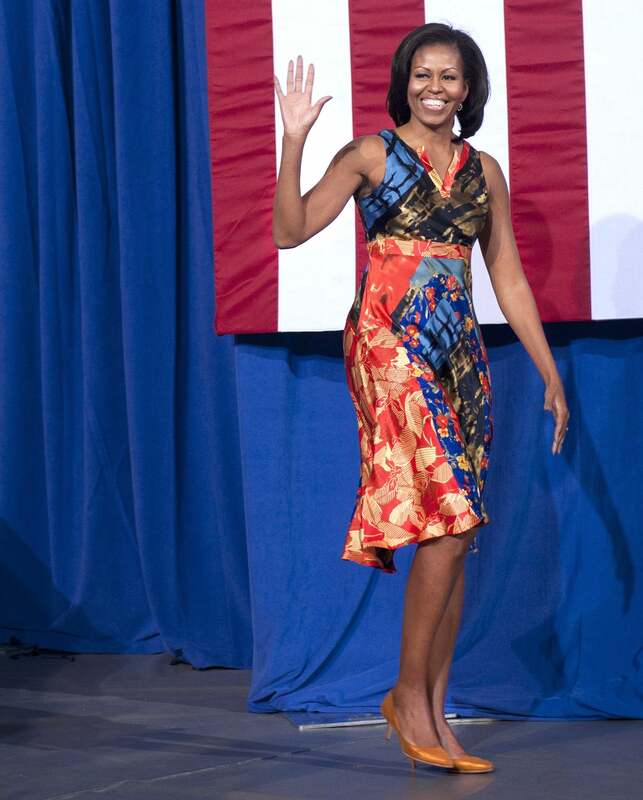 Perk up office style in a printed skirt set like the First Lady’s blooming Moschino style. 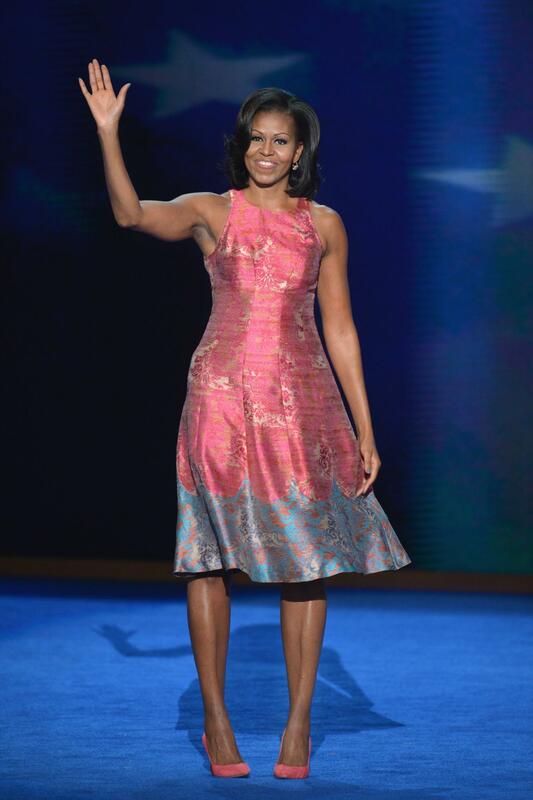 Mrs. O steps on stage in an intricately embroidered skirt and soft multi-hued bangles to accent the look. 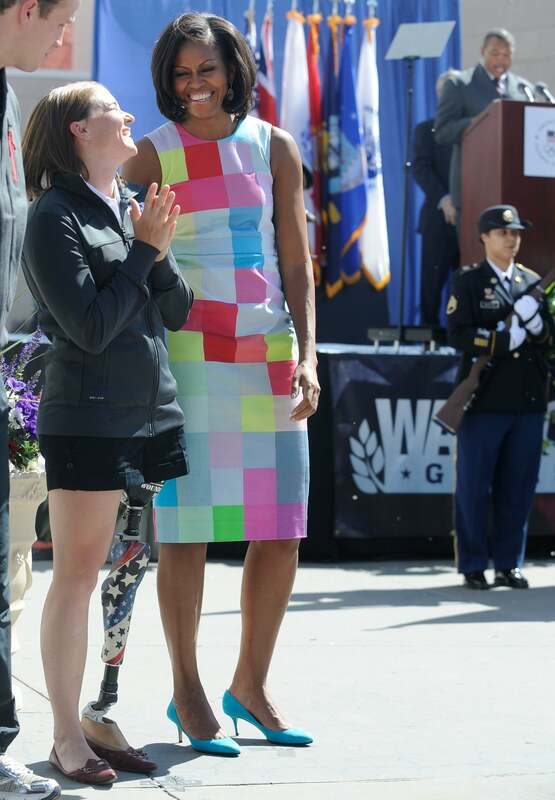 For the Korean War Medal of Honor ceremony, Mrs. O brightens up the day in a pretty flower appliqué shift. 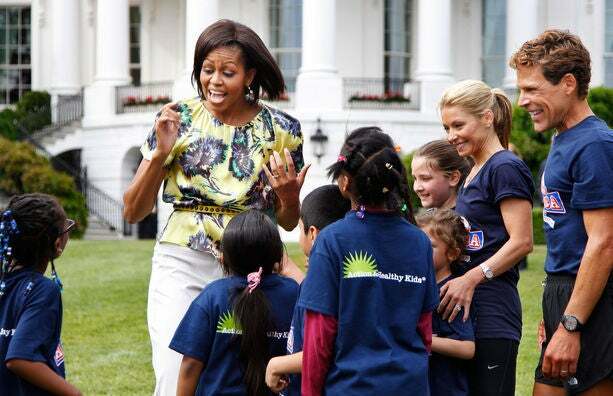 The first lady’s uniform — a printed dress and cardigan, never fails her. It’s simple but always so chic. 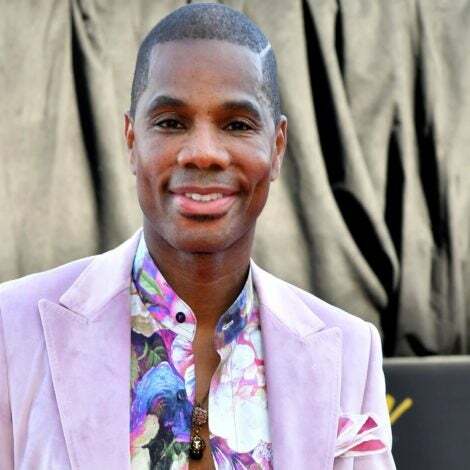 Add a little oomph to your closet staples this spring by simply brightening up the palette. 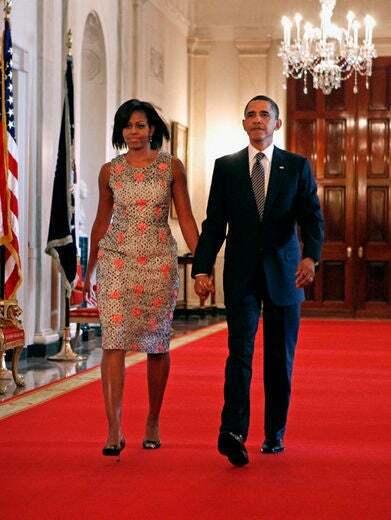 It’s all about the florals on Michelle Obama’s ravishing wrap dress paired daintily with metallic ballet flats. 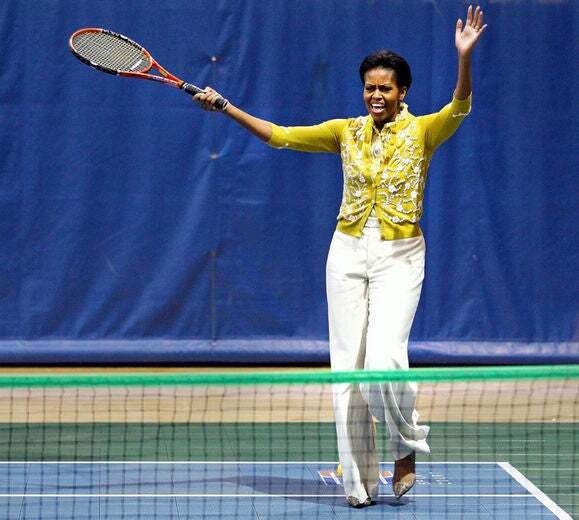 Mrs. Obama is stylish even on the tennis court. 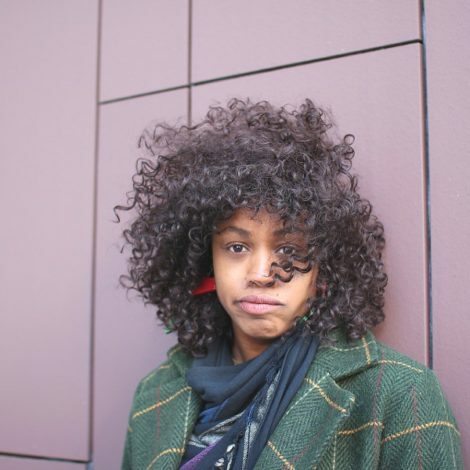 She serves fashion in wide-leg pants paired with a vibrant cardigan. Colorblocking is cool, but don’t shy away from perfectly matching accessories. 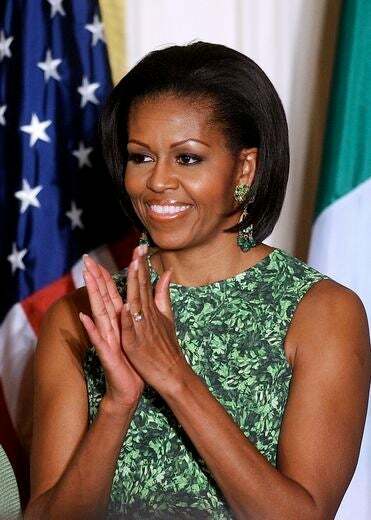 Take note of Mrs. Obama’s St. Patrick’s Day green printed Marc Jacobs dress and chandelier earrings. 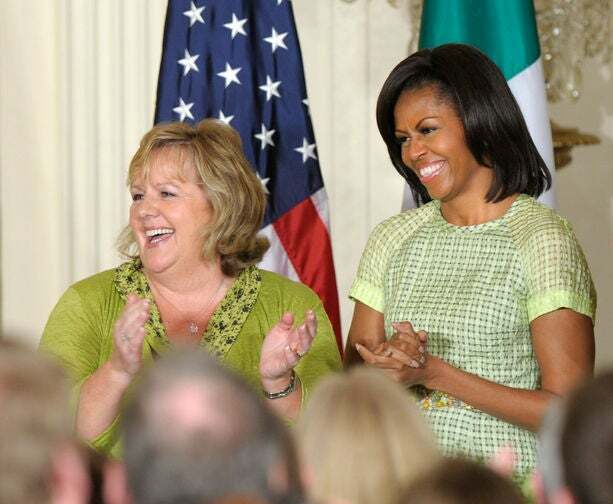 Experiment with new colors and patterns like the First Lady’s plaid dress in this unexpected soft lime shade. Mrs. O taps into her patriotic spirit in a striking blue and red Sophie Theallet dress on Independence Day. 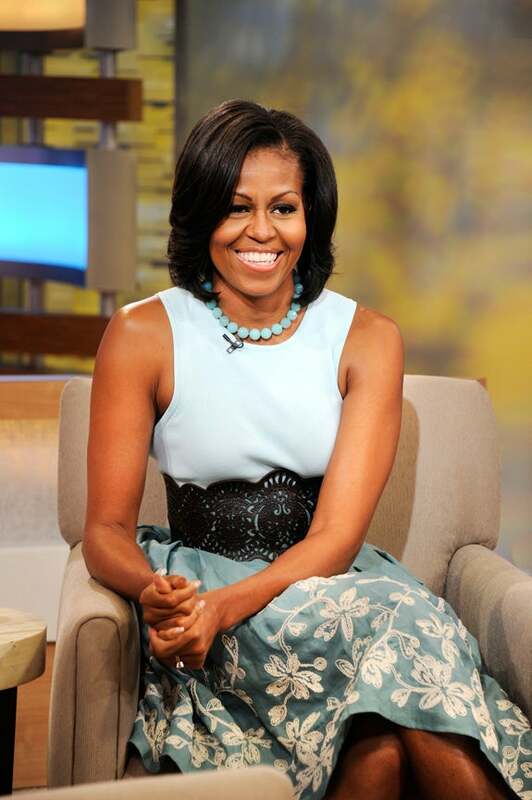 The First Lady keeps fashionable and fit in a printed Peter Som top and matching belt while chatting with young runners on the LIVE with Regis and Kelly show. 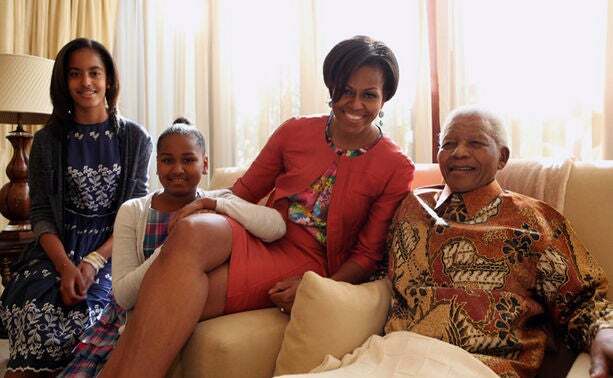 During a family visit with Nelson Mandela, the First Lady selects a special Narciso Rodriguez silk shantung suit and brightly printed top for this extra special moment. 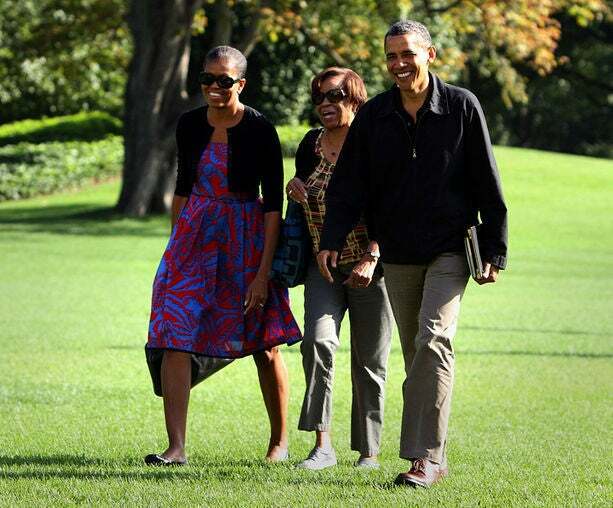 Mrs. O strolls the White House lawn in a striking Sophie Theallet dress with her mother and husband.